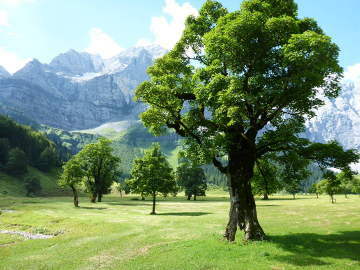 This trip is going through the Tuxer Alps, then down through the Inn-valley and up again, Karwendel and later Allgäu. In Finkenberg, the Balthasarhof (nr 126) you will be welcomed with a schnapps. B&B €35pp. Recommended, I had dinner in nearby Hotel Eberl, where locals sang some beautiful authentic Jodl music. Penken is a depressing place. The top station is a huge squarish building with a shopping mall inside. Surroundings are flattened by a bulldozer to comfort the skiers, thereby burying the Via-Alpina track. Find the track by going to the closed down gasthof between the two cable-stations, go underneath a bridge and on the back of that house you will find a road-sign. A little after, just after another ski-lift, you will find the passage through the valley of the Horbergbach is closed. Walk up the valley until you reach a most horrible deserted ski-resort, pass the closed Eisberghutte, ignoring the 'Hikers strictly forbidden' sign, and climbing a barb-wire fence, to return on the other side of the valley. The road ends up in a meadow. Climb up to the asphalted road, and follow that down. Having lost too much time, I had to go to Waldhaus Mösl. The dorms are for children groups only. Private room €50HP. It is a very chaotic place, when I entered my room I found it was already occupied. Then the warden inspected all the other rooms to finally find one that was empty. Also the food is very poor. I went to bed hungry. Not recommended. Stay out of the abandoned ski-resort of Hochfügen. 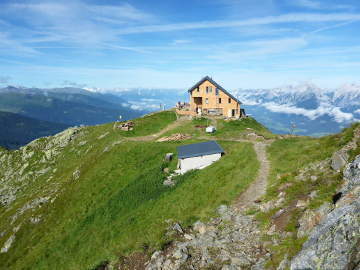 Try to make it to the Kellerjochhütte, with a beautiful view over the Inn-valley and Innsbruck. You will also see the Zug-spitze that you will pass later. Be sure to fill up your water-bottles in Loassattel, because there is no drinking-water at the hut, on the ridge the next day, until you are down in the woods again. In Schwaz you will stay at Pension Clara, just some 100m from the stage end-point. €38 B&B. Ask anybody for the way. 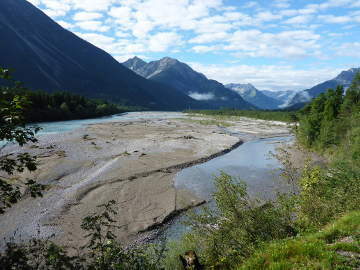 Or walk down to the river, and turn right 300m to the tourist office. 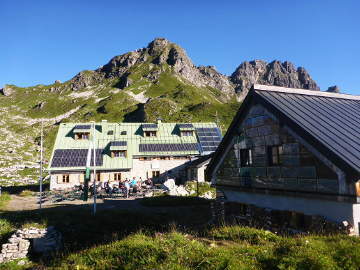 Note that all the huts are full of day-tourists and bikers in the Karwendel area during the high-season. Some huts will not even take a reservation if you don't call at least a week before arrival. If full, you will be put on a mattress on the floor. There is a taxi service from the Karwendel Haus to Scharnitz (plm 20km). €105, share price with other passengers. The hut warden will order the taxi for you. In Scharnitz I was welcomed in Haus Seibold (nr317), behind the church. €30 B&B. The warden is a one-time hiker himself, and you can ask him anything. Important detail: you will get a soft boiled egg with breakfast! The tourist office is opened until 17, Sundays closed. Have yourself informed about the diversions caused by the building of a tunnel on the Via-Alpina track! 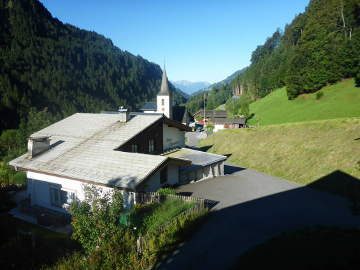 Coming from Scharnitz, on the main road turn right 50m to go to the Bergwelt house. €30 B&B, very friendly elderly lady. In the breakfast room see all the stuffed hunting trophies. Wifi! At the Meilerhut, the highest hut on the VA around (2366m), do not forget to make use of the original Plumsklo. 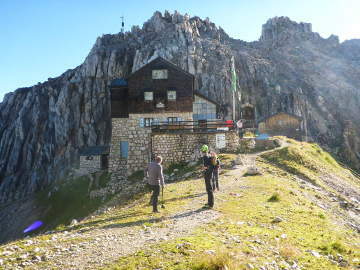 Horrible night at the Reintalanger Hut, which was packed full with Zugspitze climbers. I heard the same about the next Coburger Hut (long holiday weekend in Germany). 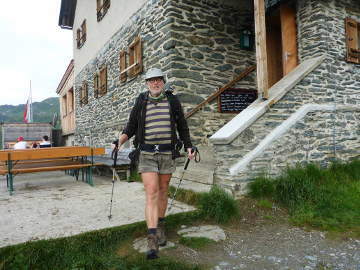 So I inquired at the Hochfelder Alm, and it turned out that since 3 weeks they had accommodation. Three very luxurious multi-bed rooms, showers, WLAN, all. €48 HP, dinner a la carte, and wine included. Very well recommended. Beautiful view on the lake and the surrounding mountains. Wolfratshauser Hut is in winter more popular than in summer. So chances are real that you will spend the night alone for a change! Showers are free. Gasthof Lamm was full, but the staff was willing to phone around and found a room at Haus Olga Wachter, Zittenhof 4. 500m west of the center. €30 B&B, very pleasant. Dinner in the Lechtalstüberl, Pfarrweg 18. Simple place, but friendly people. The track to the Bockkarscharte is hard to find. Grass has overgrown it, and cows made their own alternative tracks. But the GPS track is quite good here, use it and you will be OK. Watch the memorial on the Scharte, erected for an officer in 1939; with a nazi symbol still clearly visible. In Oberstdorf, go directly to the Tourist Office before 5PM, next to the train station. Finding accommodation can be problematic in this town. I was sent to Hotel-Garni Rex, Wenzeslausstr, next to the Kurpark. €60 B&B. In their pamphlet I read they would also have a cheaper 'Bergsteigerzimmer'. Just ask for that and see what happens. The time from Guggersee to the Hut is much longer then the mentioned 1h50. My time was over 3 hours. From Ober-Überlutalpe to Buchboden there is a short-cut, which will save you from walking down the zig-zagging motorway going down. May be slippery when wet. It is not on the GPS track, but the way is sign-posted -with beautiful Via-Alpina logos! You can't miss it. In Buchboden there are just 3 places to stay: Gasthof Kreuz, Pension Jäger and Haus Schönacher. The latter is the first white house in the village. Everything was full, but when I called at Schönacher, the very friendly lady let me in a room that was originally closed for cleaning. €40 B&B. There is a reading table with books about local history and culture. According to the people in Gasthof Thüringerberg there is NO accomodation in this village, nor in Schnifis. So I had to take the bus back to St.Gerold, Gasthof Kreuz. Pleasant stay there. The Tourist Office is in the Montfort House, just as you enter the old town. Look for the green 'i'. Very helpful people, they will give you a Via-Alpina overview map. I was sent to a pension way out of town, easily reached by bus. There is also a Youth Hostel close to the station (which was full then).